Astrology is a science of indications and so the horoscope often indicates the typical tendencies and aptitude of a person whether he will opt for business or service. In the present series of research articles, it is proposed to study the astrological combinations, which produce industrialists and businessmen of different categories. It is observed that the signs Taurus, Gemini and Libra generally produce businessmen and so these persons mostly have their ascendants, ascendant lords or the Moon in one of these signs. Let us now briefly study the typical characteristics of these signs which are relevant to business as a profession. Taurus : The sign is a practical one and these persons, by nature are plodding, patient, enduring and persistent. They never waste their energies. persons of strongest will are born in this sign, hence they can become good businessmen. They have much perseverance and are steady. They have got tremendous physical and mental vitality. In the natural zodiac, Taurus is the second sign and so denotes finances. Thus Tauresians are best suited to a profession which involves financial transactions. Its Lord Venus is a natural signification of riches and comforts. Gemini : The sign denotes dualistic tendencies and so these persons are rarely content with a single occupation or pursuit. They can very easily adapt themselves to their surroundings and are remarkable for their versatility. Gemini is a natural signification of arms and hands and so these persons are successful in all activities that are related to hands. It is very difficult for others to understand them and their peculiarities. They are rather impulsive. The ruler of this sign in Mercury, the natural signification of business and so these persons understand and analyse the things quickly. Libra : Libra denotes a balance. So these persons have a good power of comparison. They seem to be able to weigh and balance all things mentally. They are remarkable for their perceptive faculties. They have got a good intuition and so succeed in all types of business mental equilibrium. Being an airy sign it confers a fertile imagination and correct intuition. They have a capacity to handle any situation tactfully. Generally Librans gain materially by fortune. They are best suited for business with a partner. Effect on signs : As stated above the signs Taurus, Gemini and Libra are connected with business activities. It is observed that in the horoscopes of businessmen, mostly, these signs are aspected or occupied by benefic planets Mercury, Jupiter and Venus. A benefic influence on these signs denotes a successful business career. The Planets : It is observed that in the horoscopes of businessmen, the planets Mercury, Venus or Saturn occupy own sign, exaltation sign or a friendly sign. These three planets are quite important as far as businessmen are concerned. They are mutually friendly to each other. Well placed Mercury makes one intelligent, ingenious and analytical. He can grasp the things quickly. 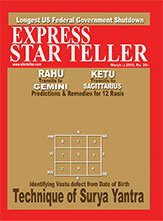 Venus is significator of money and currency and so when well placed. It denotes good monetary earning. A strong Saturn makes the person plodding, persevering and patient working. So these planets add to the strength of the horoscope of a businessman. Effect of Planets on Houses : In the horoscope of a successful businessman, the houses 1st, 10th, 7th, 9th and 11th are very important. The 1st and 11th houses denote one's profession and success achieved in it. The 7th house denotes business activities, the 9th shows fate or luck and the 11th house denotes all sorts of gains. The following effects on these houses are observed in the horoscopes of businessmen. The Ascendant : It is seen that the ascendant is mostly influenced by Mars (or Ketu). Mars is a significator of energy. This energy can be constructive or destructive. It symbolises one's ambitions and desires. So when it influences the ascendant, the person becomes very ambitious. He can do anything for achieving success in business. The 10th House : Mostly Saturn influences the 10th house in some way or the other. It denotes initial failures in the profession but promises ultimate success. Mostly businessmen face this dilemma. Saturn's effect on the 10th house gives them patient-working spirit. The 7th House : it is influenced mostly by Saturn. It denotes initial difficulties in partnerships and contracts. Saturn is also a significator of black money. Its effect on the 7th house denotes involvement of black money in business. The 9th House : this house is a significator of fate and fortune. It is mostly influenced by Jupiter. Jupiter is the best benefic representing divine grace and so its influence on the 9th enhances the dame luck. Top businessmen are the luckiest lot and so Jupiter's effect on the 9th house is a boon for them. The 11th House : Benefic Jupiter or Venus influences the 11th house. The 11th house is an important house for the businessmen, as it represents gains. The benefic influence on the 11th denotes gains in business and other connected activities. Correlation between various Houses : As per "Uttar Kalamruta", the second house denotes purchase and sell activities (Kraya-Vikraya) and enterprise for earning wealth (Vittodyamaha). The 7th and 10th houses denote business activities (Vanijyam). So we have to study these houses and the correlations between them. It is observed that in the horoscopes of businessmen, the 2nd house is related to the ascendant, the 10th the 7th and 11th houses. Among other things the 2nd house also signifies wealth and earning. A correlation of the 2nd house with the ascendant and the 10th denotes good earning from the business. Correlation between the 2nd and the 7th denotes that the business is flourishing and the capital is increasing. The correlation between the 2nd and the 11th houses a powerful dhana-yoga' and so there will be multiple gains. The situation of the 2nd lord is also very significant for businessmen. It is observed that the 2nd lord mostly occupies exaltation, own or a friendly sign. It is also observed that the 7th house is correlated to the 5th, 9th, 10th and 11trh houses. The 7th house is the chief significator house for businessmen. The 5h house denotes sudden gains and the speculation activities, the 9th denotes luck the 10th denotes profession and the 11th gains. So a correlation between these houses and the 7th and the above mentioned houses denotes a profitable partnership in the business because the 7th house also shows partner and his dealings. Various Yogas : It is noticed that the horoscopes of successful businessmen contain a few important yogas concerning wealth and prosperity as well as some other yogas. Let us briefly describe it. 1. Adhi : If benefics are situated in the 6th, 7th and 8th from the Moon or Langa. Results : The person will be polite and trustworthy, will have an enjoyable and happy life, surrounded by luxuries and affluence, will inflict defeats on his enemies, will be healthy and will live long. 2. Vasumati : if the benefics occupy the upachayas (3, 6, 10 and 11) either from the ascendant or from the Moon. Result : The person will not be dependant but will always command plenty of wealth. 3. Parijat :The lord of the sign in which the lord of the house occupied by the ascendant lord, or the lord of navamsa occupied by the lord of the rasi, in which the ascendant lord is posited, shall join a quadrant, a trine or his own or exaltation places. Results : Happy in the middle and last parts of life, receiving the homage of kings and rulers, fond of wars, possessing elephants and houses, conforming to the traditions and customs, generous and famous. 1. By the mutual association of lords of Lagna and 9th. 2. By the lord of the 9th occupying kendra, trikona or exaltaton and the lord of lagna being disposed powerfully. 3. By the lord of the 9th and Venus being posited in own or exaltation places, which should be kendras or trikonas. Results : The person will be healthy, wealthy, noble, learned, a man of high integrity and reputation, enjoying all the pleasures and comforts of life. 5. Gajkesari : If Jupiter is in a kendra from the Moon. Result : Many relatives, polite and generous, builder of villages and towns and will have a lasting reputation. 6. Pancha Mahapurusha Yoga : if Mars, Mercury, Jupiter, Venus and Saturn should occupy a kendra in its own house or exaltation sign. Results : He will have all sorts of riches and comforts. He will be successful in all his enterprises. 7. Dhana Yogas : As per Parashar, the trikonas are the places of Lakshmi and the 5th and 9th lords are the special wealth bestowing planets. It is observed that in the horoscopes of businessmen either lords of 1st, 5th and 9th houses occupy their own houses, or the lord of one trikona occupies the other trikona. Now let us discuss the business concerning iron and steel. Steel is an important ingredient of every industry, as all sorts of machines, vehicles, etc are manufactured from steel. It is observed that in the case of industrialists and businessmen dealing in iron and steel, the ascendant, the ascendant lord or the MOON occupies Aries, Virgo or Scorpio sign. Aries and Scorpio are the signs of Mars and Virgo is the sign of Mercury. Aries : It is one of the most daring signs of the Zodiac, full of activity and leadership. It rules over iron and steel, machinery, mines, etc. it is also the significator of mining engineers, metallurgical engineers, furnaces, Kilns, etc. so this sign quite suits the iron and steel business. Virgo : Virgo, being the sixth sign of zodiac, it rules over the industries. It is also concerned with military affairs, in which steel is mostly used for manufacturing army equipment. This sign also concerns business. These persons are intelligent and have quick perceptions. They are thorough, methodical, practical and discriminative. Virgo, being a common sign there will be changes in environments of these persons. They get good partners in business, mostly. Scorpio : This is another Martian sign. This sign rules over chemicals, metals, research, weapons, mining, industry, etc. The ruler of this sign, Mars, is a significator of all the machines, heavy equipment and industries and so this sign suits the business of steel. These persons are determined individuals. They can never be idle and so never waste their time. They fight to the last in every venture. They have fertile imagination and sharp intellect. The Planets : It is observed that mostly the planets Saturn and Mars occupy own house or debilitated with the cancellation of debilitation. It is mostly retrograde. Saturn is the chief significator of iron and steel; and so when it is strong in the horoscope it denotes that the person will be successful in all pursuits concerning iron and steel. Fortification of Mars is also useful for steel business. It is also observed that mostly Saturn and Mercury occupy kendra or trikona houses. Saturn denotes steel and Mercury rules over business. So when both these planets are well placed the person becomes a successful businessman in steel. The Signs : It is observed that in most of the horoscopes of steel businessmen, the signs Cancer and Capricorn are aspected or occupied by Saturn. The sign Cancer signifies mines, Commerce, business, etc. So when Saturn influences Cancer, it denotes business concerning steel. The sign Capricorn denotes minerals, mines and ores. It also rules over industrial, engineering and business in general, the sale and purchase of products, dealers in metals. So the association or aspect of Saturn to Capricorn is also useful in present case. It is also observed that in some cases the sign Capricorn is occupied or aspected by Mars or Ketu. 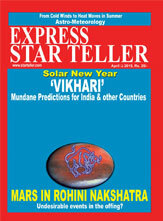 Mars is also the significator of steel industry and so its influence on Capricorn is noteworthy. It is seen that in most of the horoscopes of steel businessmen, the sign Sagittarius is occupied or aspected by Jupiter. The sign Sagittarius denotes military equipment, interstate and international commerce, import business. Jupiter's influence on Sagittarius is thus helpful in promoting the steel business. THE HOUSES - It is observed that the 4th house rules over minerals, which are found in the mines. So the fortification of the 4th house denotes that the person's profession concerns mineral and ores. 1, It is observed that in the horoscopes of businessmen of steel the ascendant is influenced by the 3rd and 4th houses. The 4th house denotes mines and earth products, the 3rd denotes the transport and communication equipment in which steel is used. The ascendant denotes one's profession and career and so the correlation between the ascendant and the 3rd and the 4th houses is quite justified in this case also. 2, The 9th house is influenced by the ascendant. The 9th house also rules over national trade and commerce as well as import and export. It also signifies luck and divine help. So the influence of the ascendant on the 9th denotes success and luck in the commercial activities. It is observed that the horoscope of a successful businessman of iron and steel contains some of the following yogas. The 10th from the Lagna or the Moon should be occupied by a benefic planet. Results: The person will achieve lasting fame and reputation. He will lead a prosperous life. Lords of the 4th and 9th houses should be in kendras from each other. Results: The native will be stubborn, daring, head of a small army and a few villages. 2. When lords of 9th occupies ken dra, trikona or exaltation sign and the lord of Lagna being disposed power fully. 3. When the lord of the 9th and Venus are posited in own or exaltation places, which should be kendras or trikonas. Results : The person will be wealthy, noble, learned, a man of high integrity and reputation, handsome appearance, a good ruler and enjoying all the pleasures and comforts of life. The lord of the sign in which the lord of the house occupied by the ascendant lord, or the lord of the navamsha occupied by the lord of the rashi, in which the ascendant lord is placed, shall join a quadrant, a trine or his own or exalted places. Results : Happy in the middle and last parts of life, receiving the homage of kings and rulers, fond of wars, conforming to the traditions and customs, generous and famous. Planets other than the Moon occupying the 12th from the Sun. Results : The subject will be happy, prosperous, liberal, favourite of his ruling classes. If Saturn occupies kendra, which should be his own or exalted sign. Results : One born in this yoga will command good servants. He will be the head of a village or town, will get ample wealth from occupation denoted by Saturn. It is caused by the disposition of Mercury in a kendra which should be his own or exalted sign. Results : The person will be strong. He will be successful in business and will help his relatives. Also he will live upto a good old age. DHANA YOGAS : Mostly some of the following yogas are present in the horoscope. 1. The 9th lord occupies 9th house or aspects. 2. The 7th lord occupies the 7th house or aspects it. 3. The 2nd lord occupies the 2nd house or aspects it. 4. The 7th lord occupies the 2nd house or aspects 2nd house or 2nd lord. 5. The 11th lord occupies the 9th house. 6. The 7th lord aspects the 9th house or the 9th lord. 7. The 9th lord aspects 11th house. The above yogas are very important for a successful businessman. They involve the 2nd, 7th, 9th and 11th houses, and so give ample wealth and gains from business. Let us consider an example horoscope of a leading businessman dealing with steel. He was a famous industrialist dealing with steel. In his horoscope the ascendant is Scorpio, which is a significator sign for steel industry. The planet Mars debilitated and its debilitation is cancelled. The important sign Cancer is occupied by Saturn and the sign Capricorn is aspected by Saturn. Also the sign Capricorn is aspected by Mars and Ketu. The sign Sagittarius is aspected by Jupiter. The 4th house is aspected by three benefics Mercury, Jupiter and Venus. The ascendant lord is conjoined with the 3rd and 4th lord. So the ascendant is influenced by the 3rd and 4th houses. Also the ascendant lord is placed in the 9th house along with the 9th lord, thus the 9th house is influenced by the ascendant. Yogas Amala, Kahala, Lakshmi and Vasi are present in the horoscope, Also, the following dhana yogas are present in the horoscope. 1. The 9th lord occupies the 9th house. 3. The 7th and 11th lords have con joined. the horoscope of a businessman can indicate the commodity with which he deals.